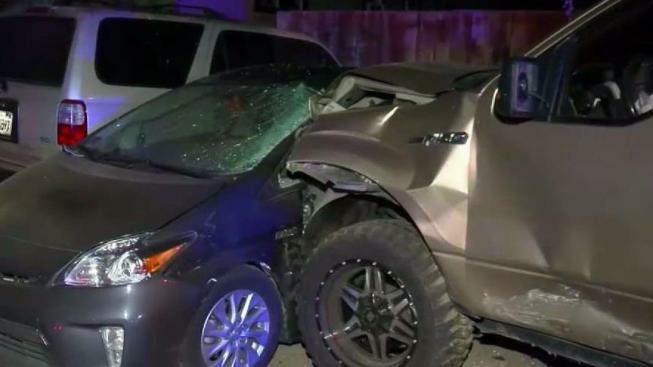 Multiple vehicles were damaged and at least three people were reportedly injured following a hit-and-run crash just south of downtown San Jose early Thursday, according to police. The crash occurred just before 1 a.m. along the 900 block of Vine Street, according to police. The suspect driver struck another vehicle, went off the roadway, struck at least two parked cars in a driveway and ended up on the front lawn of a property, according to police. First responders had to cut apart the vehicle that was initially struck in order to free the victim, according to police. The victim was transported to a local hospital. Their condition was not immediately known. Three people in the suspect vehicle took off from the scene on foot, police stated. The driver and one of the passengers were found a short distance away. They were transported to the hospital with non-life threatening injuries. The third person from that vehicle has yet to be located. The driver has since been booked into the Santa Clara County Jail for felony hit and run, according to police. At this time, it does not appear that alcohol or drugs played a role in the wreck, police said.